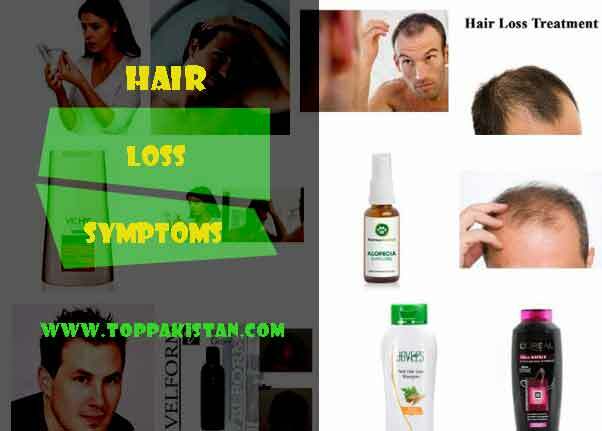 The People who are losing hair are always keen to know about hair loss symptoms. Hair is considered to be our crowning glory, proper care needs to be taken so that its sheen & sparkle is maintained for a longer duration of time. A healthy hair is always an indication of a healthy mind & body. Unfortunately our lifestyle, harsh weather, poor hygiene, harmful chemicals etc leads to hair loss. Everyone wants to have a glowing & shinier hair, but not many people know that the methods or products they use (even at salons) can bring the downfall of their hair. When the hair starts getting damaged the, strands are weakened, the outer covering of the hair (cuticle) starts to rupture. Because of this constant rupturing, the cuticle starts to vanish-layer by layer. The next layer which is the cortex is then bared open. Slowly but surely split-ends starts emerging. Due to which the hair snaps open. The hair feels dry & fragile when touched. Suddenly the hair is full of tangles, thereby making the task of combing a difficult & an irritating one. Spilt-ends start forming at the tips regularly and hair becomes too rigid to deal with. It now appears to have formed into a coarse texture & has a very porous feel to it. The supple nature of the hair which was evident before is not so now. When wetted they become entangled easily. Poor Lifestyle : Keratin which is a protein matter, constantly needs regular intake of protein (chicken, fish, nuts are rich in proteins). And the growth of these keratin shafts relies wholly on good blood circulation in the scalp & pure oxygenated blood. What we eat & how much we eat has a direct effect on this process. Likewise B Vitamins, especially B6 are significant in retaining healthy hair. Lack of Sleep: Adequate sleep is like a miracle drug for preventing hair losses. Studies have shown that less sleep plays an important role in changing the hormone balance within the body that leads to hair loss. Since we get devoid of our sleep due to the fast-paced & competitive world, there are heavy chances that stress & fatigue will cause hair damage in the long run. Poor Hygiene: Problem arises when people hardly wash their hair or when they overdo it. Because of the already present natural oil (sebum), shampooing your hair everyday can deprive it of sebum. One should use a milder one if hair needs to be shampooed on a daily basis. The other aspect here could be insufficient washing. This piles up the accumulated dirt & oil due to which the hair looks greasy. Not to mention the product residue that is also left unclean. Sun Damage: The heat & humidity which comes along with sun, especially during summer tends to make the hair drier & frizzier. Moisturizing the hair in such situations is the encouraged. The hair should be left to dry naturally & blow dryers should be avoided. Hair Products: One should make it a habit to interpret the labels of hair care products. Hair sprays & gels contain chemicals which help to dry the scalp when used daily. If needed, one can consult their dermatologist for a better understanding of the harmful chemicals commonly used in hair products. Almost every product has a perfume or a preservative. And these chemicals can cause serious hair damage, either by inflicting an allergy or by damaging the hair in some way or the other. It’s always a better idea to switch to some other brand if you face such problems. Coloring the hair is a good option of getting a dynamic look instantly, but one should also bear in mind the ill-effects of it on the hair if not taken care afterwards. Hair colorants actually raise the cuticle so that the dye enters the layer beneath (the cortex). As a result of this artificial course, hair gets even drier. If you can use a low or no ammonia hair color, it will ensure further safety of your natural hair. An application of a deep conditioning treatment before coloring will help.